As much as there may have been some opportunities for fun and fossicking, children would have suffered through the same basic living conditions and harsh weather on the goldfields. Children were often used as another source of labour but some managed to earn their own money running errands for diggers or shopkeepers. A darker side can still be seen in the gravestones at Pennyweight Flats Children's Cemetery in Castlemaine. More than 200 children are buried there. Their weaker immune systems left them more susceptible to diseases like dysentery and cholera brought about by poor sanitation. I like the diggings very well I have washed myself about a pennyweight [2 grams] of gold besides a match box full of specimens [gold in quartz]. The other day I went with Mamma and Papa over to the quarry reef. There we saw a gentleman of the name of B Farrell he has one of the richest claimes in the reef He has made thousands of pounds [...] You will laugh when I tell you what I have been doing today, making a kennel for a puppy I have not yet got it is a very nice one made of latice. Mr Sundy is going to give me the puppy this week We began school today. Birchall, L H 1855 Papers, 1855 July-Aug. [manuscript] From the State Library of Victoria's Manuscripts Collection. MS 9328. On established goldfields school was run in large tents (capable of holding 100 children) with classes held from 9am to 5pm. Fees were paid in advance and were collected by the teacher as their salary. In 1853, a teacher's salary in Castlemaine was £350; a wage similar to other public officials in Melbourne and on the goldfields. Tents were used so that they could be relocated to meet demand should the 'rush' move on to a new area. 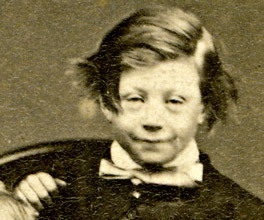 A boy of about fourteen, being in Melbourne from the diggings, was seized by a great fellow in a solitary place at night, and ordered to give up his money. The lad put his hand into his pocket; but, instead of pulling out money, he drew out a sharp knife, and stabbed the fellow [...] the lad, in a very business-like way, went to the police office, and informed them what he had done. The man was found still alive; and to the no little astonishment of the police, they beheld in him a most notorious bushranger, of whom they had long been in quest. He died the next day. The coroner's inquest found it a case of justifiable homicide, and the lad discharged. Howitt, W 1855, Land, labor and gold, or, Two years in Victoria : with visits to Sydney and Van Diemen's Land, Ticknor and Fields, Boston. The police tried to make the young man pay the funeral expenses of the bushranger. The boy replied 'What! pay for killing a bushranger? Not I, indeed. I'm the one who wants paying for the job. What's the reward?' Howitt remarks that this question embarrassed the police who did not pursue the matter any further. A quick mind was a real asset in the early years of the colony.